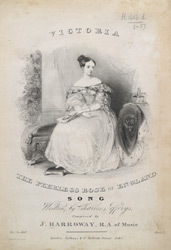 This song is a patriotic song praising Queen Victoria. It encourages feelings of pride in the country and a sense of dignity and self respect for the English. Queen Victoria was a popular monarch and although her name now stands for a supposedly prudish age, it was Prince Albert who encouraged decent behaviour, introducing a strict moral and ethical code in court. This illustration depicts her looking very youthful, she inherited the throne when she was just 18 years old and reigned for 64 years.